Note: this class is currently under development! It may not be complete and everything is in flux! 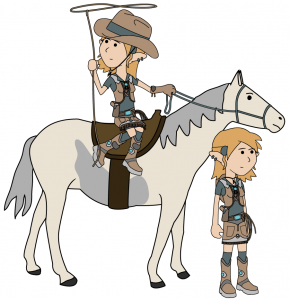 The ranger is someone who’d be home on the range, who might be a walker if he didn’t have such a swift horse. Light armor but no shields. Better to be lucky or skilled? At each level, the ranger can select either the luck or skill driven ability, but not both. The Lucky Ranger has some pretty strong abilities that can be abused if manipulated properly. While the player is obviously aware these abilities the character should never think they are a sure fire thing. To the character, these events are the result of luck and random chance, even if it seems probability is really drunk at the moment. For example, he should never intentionally fail a reflex save against a grenade in the hopes that it will be a dud. TLDR: in-character Lucky Rangers should always assume an ability won’t work as written in this section. Rangers do not take penalties while trying to use a lasso on horseback. Moving targets are always harder to hit. If a Skilled Ranger moves at least 3 squares in a turn they gain a +1 dodge bonus per 2 Ranger levels to AC. The only thing better than knowing when to run instead of shoot is knowing when to run and shoot. Lucky Rangers gain a +1 square to move speed. Additionally, as luck would have it there always seems to be a horse present whenever they have to exit a building from the 2nd story or higher. In this circumstance falling damage is ignored for both the horse and the rider. Skilled Rangers would prefer to make their own bullets than trust those churned out by assembly lines. If they have the materials on hand (cost per bullet equal to the cost of purchasing a manufactured bullet), a Skilled Ranger can create a number of bullets equal to 6 times his class level per day, the whole process taking about an hour of actual work and several hours of waiting for the chemicals to stabilize. Special bullets deal damage 1 die category larger than normal up to a maximum of d12. Special bullets are not as stable as factory produced ones and must be handled with care. Anyone who is not a Skilled Ranger who tries to fire one has a 50% chance of the bullet misfiring and exploding. Lucky Rangers have something of a love-hate relationship with technology. Equipment tends to not work as intended around them, but that’s not always a bad thing. Lucky Rangers treat natural 2’s as epic failures in addition to natural 1’s when using any form of explosive (bullets, grenades, etc.) If a Lucky Ranger fails a reflex save against a grenade or similar mundane explosion there is a 10% chance per class level that the grenade is a dud. Further, if a firearm should deal enough damage to drop the Lucky Ranger to 0 or fewer hit points he instead takes no damage as the firearm in question explodes dealing the damage that would have been dealt to the Lucky Ranger to the wielder of the firearm. This ability cannot be triggered more than once every 3 rounds. Lucky Rangers gain uncanny dodge. Skilled Rangers can throw two lassos with one action. Skilled Rangers prefer to think about their situation before wasting time and energy running around the battlefield. If a Skilled Ranger doesn’t have a clear line of sight to a target, but does have line of sight to a point that has line of sight then he can take a full round action to line up a shot that will ricochet off a solid surface. Lucky Rangers don’t have time to think about physics, mostly because they failed it like the fist of an angry god. I mean come on, it’s just memorizing a bunch of formulas and setting them equal to each other. But just because you don’t understand something doesn’t mean you can’t benefit from it. If a Lucky Ranger misses a shot with a single fire (not burst fire or full auto) pistol or rifle the bullet has a 5% chance per class level to ricochet off a solid surface and head for the original target. In the event of a ricochet roll a d6 to determine the number of times it ricocheted. When the bullet finally does reach its target it deals an extra +1 damage for every time it ricocheted. This effect can only happen once per round. This effect cannot be triggered by “buck shot” or similar types of ammunition. Sometimes you just want to shoot a lot of guys really quickly. If a Skilled Ranger has 6 guns on their person but not in hammerspace they can attempt a double hat trick. As a full round action the Skilled Ranger can draw a weapon, fire it once, drop the weapon, and repeat this motion 5 more times. The Skilled Ranger can take a single 5 foot step between any two of the shot (but only 1 such step per maneuver). Skilled Rangers can only keep 6 guns holstered for this maneuver at any given time, but they can perform it again the round after they manage to have six guns holstered again. Lucky Ranger, all mundane explosions are 2x the size, 1.5 times the damage, and 50% chance to take no damage from an explosion.